Tour de Stour Audax is on Saturday 6th April if you fancy a longer ride than ours. Choose 50/100/160k. Cycling event starting from Village Hall, Long Melford CO10 9JQ. www.aukweb.net/events/detail/19-280/ Enter online. Please note that first SATURDAY of most months will be aimed at new/returning riders. Day Ride Saturday 6th April 10.00am Lynnsport A ride to Landymore's Tea Room, Stowbridge. Flat. 25 miles, with option for train return after 16 miles. Great cake! Evening meet Thursday 11th April 8.00 pm at Ferry Lane Sociable meeting. Bike Train Ride Sunday 21 April 10.00am Lynn Rail Station, 10.10am Lynnsport, 10.30am North Wootton Green, 11am Roydon Union Jack, 11.45am Old Station Little Massingham, 12.15pm East Rudham Green, 12.45pm Shereford Crossroads - A "Bike Train" to Fakenham to watch/support The Easter Criterium. https://www.activefakenham.org.uk/easter-sunday-2019-criterium-races/ About 26 miles each way. Day Ride Saturday 27th April 10am Lynnsport A ride to Bircham Windmill. Gently rolling. About 32 miles. Great cake! EXTRA Evening Meet Wednesday 1st May - presentation will start at 7:30pm. The Anvil, Congham. A presentation about the proposed Norfolk Greenways. Thanks to Norfolk CTC. Day Ride Saturday 4th May 10am Lynnsport Yellow Welly Ride to Old Hunstanton Life Boat via Sandringham Visitors’ Centre where we hope to raise funds for the RNLI. Any previously raised donations will be gratefully received on the day. Rolling country. About 38 miles. Day Ride Monday 6th May 0744 train from KL to Cambridge, Join lots of riders at Cambridge Market Square for a 12-14 mile flat ride to the noon opening of Reach Fair. Lemonade stall part-way but may sell out. Arrive 0900 for a 1000 start. The 0844 train is a last minute option, but cutting it very fine. An optional start from Ely may be necessary if there are works on the Cambridge line. www.camcycle.org/events/rides/ Back to Lynn by train from Ely (12 miles) or by bike (40ish miles, depends on route). Evening meet Thursday 9th May 8.00 pm at Ferry Lane Sociable meeting. Day Ride Saturday 18th May 10.00am Lynnsport A ride to Welney Wildfowl Centre cafe. Flat-ish. 53 miles. 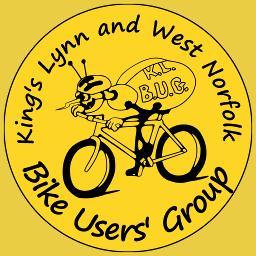 Day Ride Sunday 26th May 10.00am Lynnsport A ride to Wells-next-the-Sea. Rolling. 60 miles. Day Ride Saturday 1st June 10.00am Lynnsport A ride to The Stag, West Acre. Gentle. 32 miles. Day Ride Saturday 8th June 10.00am Lynnsport A ride to The 20 Churchwardens. Gentle. 40 miles. Evening meet Thursday 13th June 8.00 pm at Ferry Lane Sociable meeting. Day Ride Sunday 16th June 10.00am Lynnsport A ride to Snettisham, exact destination decided on the day. Rolling. 24 miles. Long Day Ride Saturday 22nd June 0644 train from KL to London A ride to King's Lynn. Varied. 111 miles. Bike Train Ride Thursday 27th June TBC Lynn Rail Station, TBC Lynnsport, TBC North Wootton Green, TBC Castle Rising Black Horse A "Bike Train" ride to Sandringham to watch the national championship time trials. Times will be confirmed on the website and next list. About 9 miles each way. Day Ride Saturday 29th June 10.00am Lynnsport A part-off-road ride to Sandringham Visitor Centre. We go off-road past Church Farm, opposite Mintlyn Wood. We pass Spot Farm and Warren Farm and join a metalled road to Grimston via Pott Row. Then off-road through Congham Wood to Hillington where it’s plain sailing to Sandringham via Flitcham. About 23 miles. Day Ride Saturday 6th July 10.00am Lynnsport Wisbech Rose Fair. Parade of floats at 2 pm organised by the Wisbech Round Table Theme “For the Love of Music”. Between 36 and 42 miles depending on route chosen on the day. On Sunday 7th July is the Holkham Outlaw Half Tri. Bug volunteers have helped in a previous life. If anyone fancies volunteering this year let Trev know and we’ll get it organised.